The Women’s class usually presents some of the best racing of the week, but the expected Mackenzie Tricker/Courtney Duncan battle nearly went up in smoke in the first turn. Tricker grabbed the Motorcycle-Superstore.com Holeshot, but Duncan went flipping over the handlebars. By the time she got up, she was a half lap behind the entire field, and yet somehow ripped through the pack to finish 7th, salvaging at least an outside shot at the title over the course of three motos. 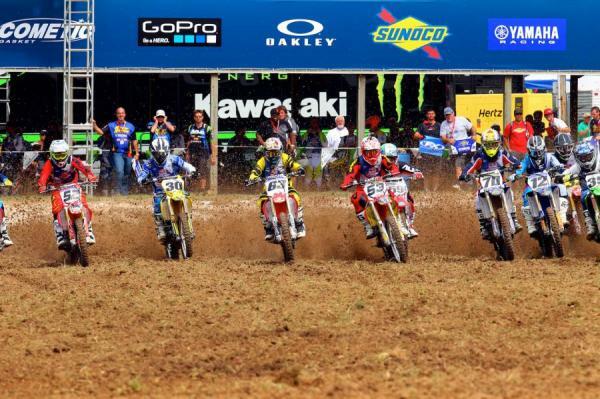 One day of racing is complete at the Red Bull AMA Amateur National Motocross Championship presented by Amsoil at the Loretta Lynn Ranch. 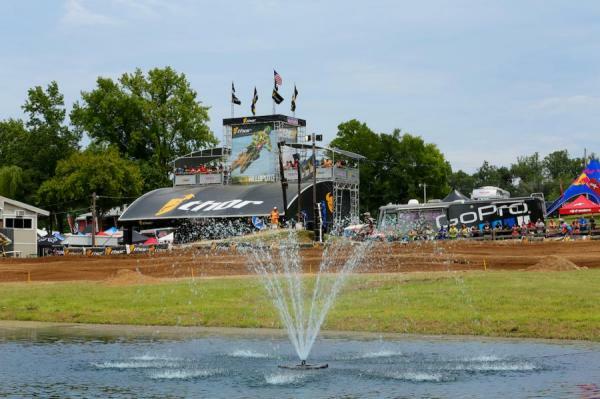 One Loretta’s tradition was not honored today, as the searing heat that usually marks this event was absent, replaced instead by perfect conditions early in the day. Then Loretta pulled one of her old tricks, dropping rain on the track during intermission and never letting up after that. 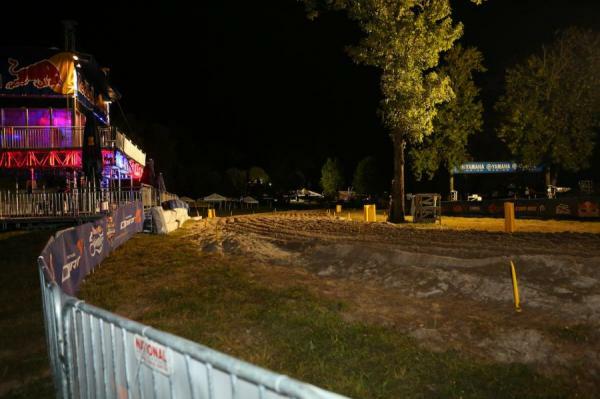 By the day’s final motos, the track was wet, sloppy and rough, making for a true challenge for even the most skilled riders. Ferry took two gold moto medals today, scoring the 35+ win to go along with his 25+ victory. Both were come-from-behind efforts, but only because Red Dog was a victim of bad gate picks in the AMA’s random selection—37th pick in one moto, 40th in another. 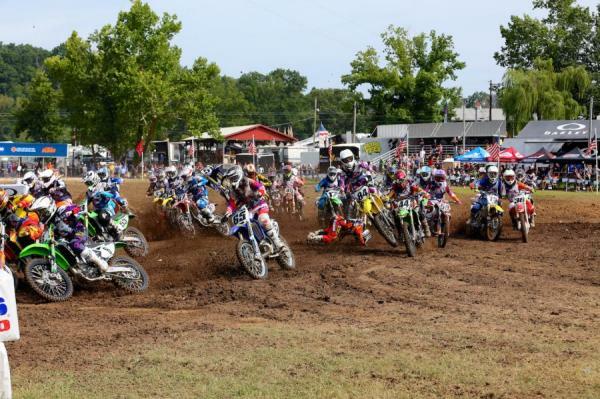 James Povolny holeshot both of those races. In 35+, Robbie Reynard tracked Povolny down to take the lead, before Ferry put on a charge in lapped traffic to catch RR and snag the win. Ferry was way back in 25+ also, but got to Povolny with two laps to go. Things are looking good here at the Ranch. Well, 'cept for some rain. 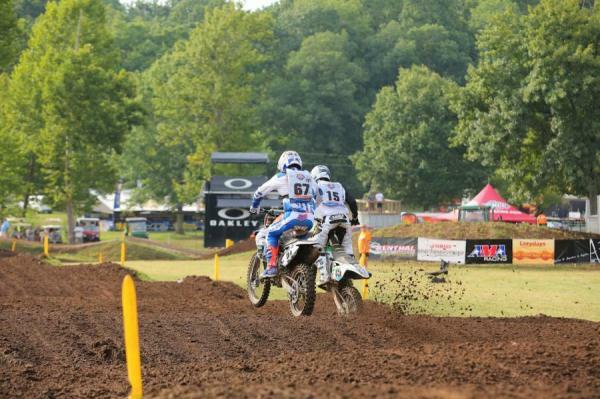 Reynard and Ferry went at it in the second moto of the day! Ferry went big in his first race here since 1992, scoring two moto wins. Of course this event is about the kids, too, and several of them put on great rides. Kawasaki rider Garrett Marchbanks put on a show in 85cc (9-11) Limited, starting about 12th, losing his goggles in the rugged conditions, and then charging all the way back to challenge the leader, Jalek Swoll. They battled all the way to the end, flying across the finishline at the checkers side by side! 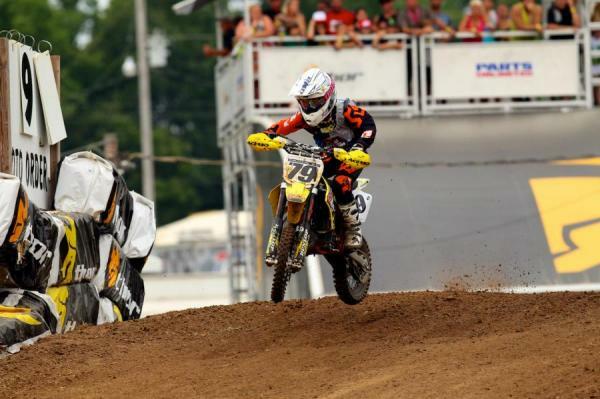 Marchbanks edged ahead for the moto win. Later, the boys hooked up again in the 85 (9-11) Mod class, but it was Carson Mumford who put on the comeback charge for the win there (Mumford was fourth in the Limited moto). Marchbanks finished third with Swoll second. 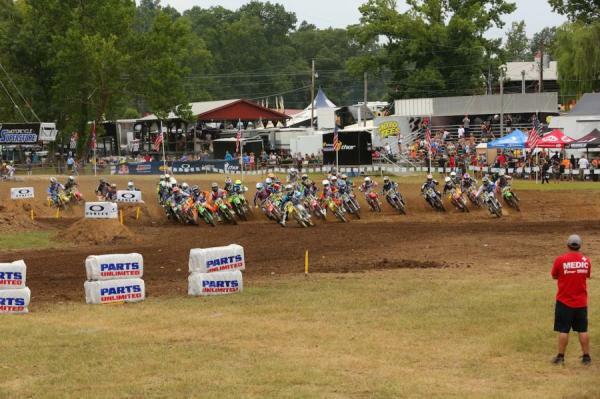 Once these kids all get their gate picks and starts dialed in, the racing will be incredible. One age group below that sits the 65cc classes. Ty Masterpool nearly had the heartbreaker of the day when he tipped over while leading 65 (10-11) and couldn’t get his bike started, pushing him back to about eighth. Then he logged a masterful charge, running as much as four seconds a lap faster than anyone else to get back to second place, and even get moto winner Jace Kessler in his sights. Kessler hung tough to take the win. In Mini Sr., Team Green’s Sean Cantrell dominated the proceedings. But in Mini Sr. Limited, which is the old stock class, he ran into problems and took a tenth, with Joey Crown capturing the win. It was a full-on mud bath in that moto. 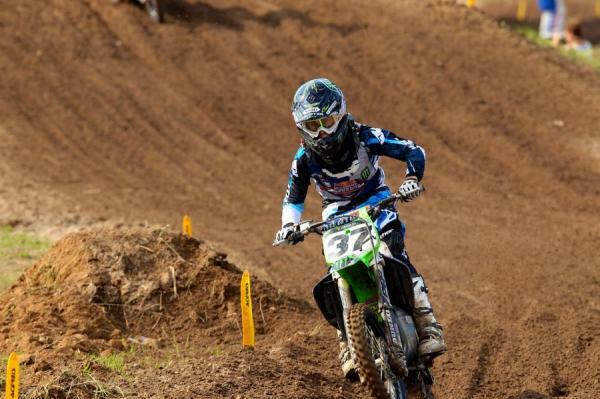 Ryan Surratt styled his way to the Schoolboy 2 B/C moto win. 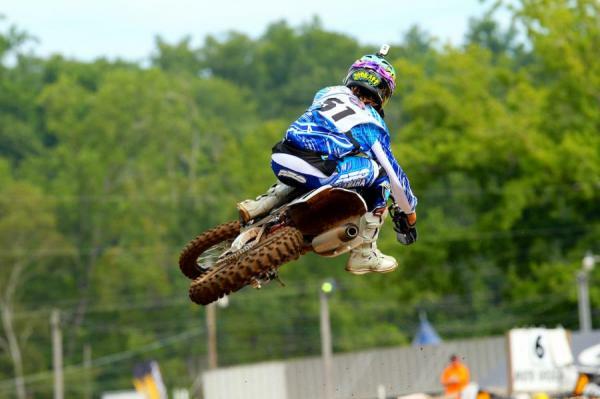 Jett Reynolds dominated his 65cc class. Can anyone think of a good nickname for him? Hmmm. 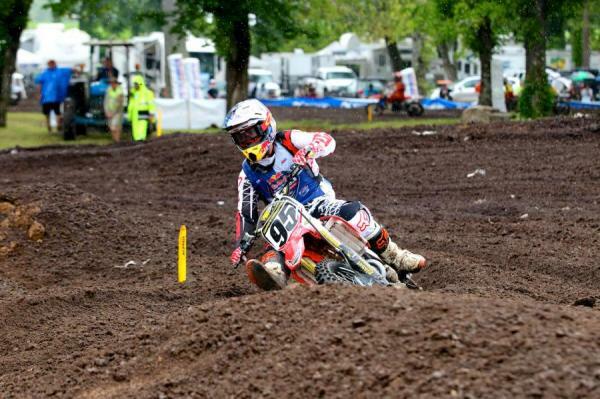 Sean Cantrell scored a big win in one Mini Sr. moto, but wasn't so fortunate later in the day during a mudder. The Women’s class usually presents some of the best racing of the week, but the expected Mackenzie Tricker/Courtney Duncan battle nearly went up in smoke in the first turn. Tricker grabbed the Motorcycle-Superstore.com Holeshot, but Duncan went flipping over the handlebars. By the time she got up, she was a half lap behind the entire field, and yet somehow ripped through the pack to finish 7th, salvaging at least an outside shot at the title over the course of three motos. Tricker, meanwhile, led from gate to flag. Maybe the most impressive ride of the day came in the 250 B class, as Factory Connection Honda’s Jordon Smith grabbed the early lead, went down on lap one, got up in tenth, and then came back to take the lead by the third lap! Smith has been basically unbeatable throughout the year in the B class. Congrats out also to Yamaha’s Aaron Plessinger, who won 450 B. In the two Schoolboy classes, Jarek Balkovic came out best with a win and a second in his motos. Ryan Surratt won a Schoolboy moto, as well. 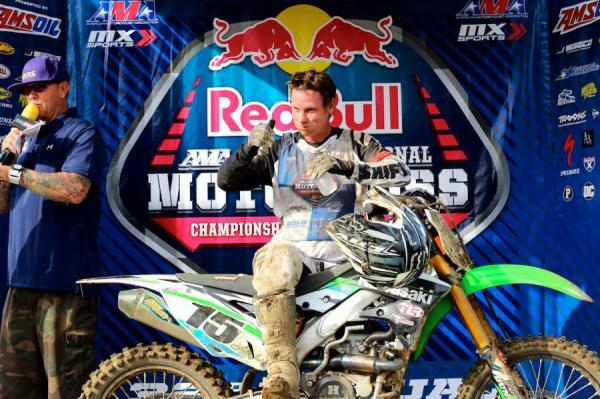 Finally, Matt Bisceglia made an early grab at the AMA Horizon Award by winning the first Open Pro Sport moto handily. In this photo, the Kiwi YZ125 ripper Courtney Duncan is down and down hard in a first turn crash in Women's 14+. That's her #51 Yamaha flipping through the air while she hits the deck 15 feet away. She got up to finish 7th! Matt Bisceglia rolled in Open Pro Sport. Riders now hit sand right out of the gate, and they'll find plenty more of it around the rest of the track. It's rough! That's the best of the best in every class.